As part of the Federal Triangle Complex, the Department of Commerce Herbert C. Hoover building remains fully operational as 13 years of renovations ensue. Operational for over 85 years and located in the heart of our nation’s capital, the 1930’s Herbert C. Hoover U.S. Department of Commerce building is home to the White House Visitor Center as well as approximately 3,500 dedicated employees, concerned for the economic growth of America. The visible day-to-day wear and tear of the building launched a General Services Administration (GSA) modernization initiative back in 2008 with Gilbane|Grunley, as a joint venture, chosen to take on the 13 year, 8-phase project as GSA’s Construction Manager as Constructor (CMc). Working in downtown Washington DC, the goal of the project is to renovate crucial building systems, rejuvenate structural deterioration as well as restore comprehensive cosmetics, all while maintaining the utmost importance on the integrity and safety of employee and pedestrian traffic throughout the interior and exterior of the occupied building. Having already completed the first 3 phases, Gilbane|Grunley began their quest focusing on the crucial primary electrical systems, select life safety and ADA upgrades, abatement of hazardous material, the build- out of and installation of a new roof and skylight over Courtyard 6, and replacement of the cooling towers. The build-out of Courtyard 6 for swing space was crucial to daily operations of the building as the occupants have used that area for temporary operations through all phases of construction. 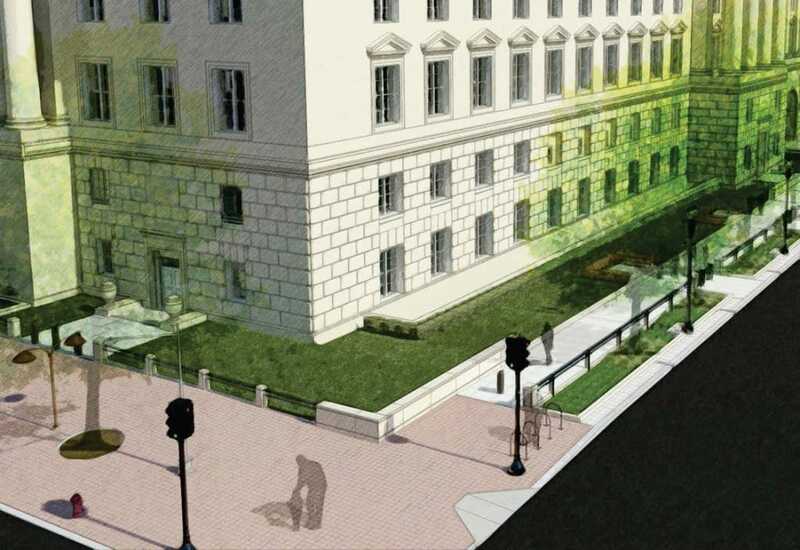 The exterior cleaning and re-pointing of the Pennsylvania Avenue façade brought the exterior upgrades to life as pedestrians could admire the work being done. Since then, phases 2 and 3 included an full renovation of the South portion of the building from top to bottom. This consisted of historical restoration work in the bathrooms and elevator lobbies as well as cleaning and restoration of the entire exterior of the building. Major constructability issues that eliminated potential cost and time impacts were resolved during the pre-construction process. We performed numerous value engineering exercises to comply with the budget constraints, were successful at achieving the project funding goals, and provided an uncompromised quality product. Currently, phase 4 involves replacing the electrical distribution, plumbing, HVAC, ceiling, and lighting systems. System updates also include the installation of a new fire alarm and sprinkler system. To ensure the safety of the building, the team has begun the remediation of existing structural issues, replacement of failing interior perimeter walls, ADA compliance, retrofitting stairwells to mitigate seismic collapse, and the installation of tenant improvements. In addition to the upgrades and renovations, Gilbane|Grunley will be reconstructing all new administrative office spaces, conference and meeting room space, public areas, bathrooms, SCIF spaces and a data center. By the end of this 13-year project, the historical U.S Department of Commerce Herbert C. Hoover building will be brought back to life, transcending time for years to come. Our focus remains on the integrity of the building, safety of its people, and rejuvenating the majestic architecture that has stood the test of time. Phase 3 of the renovation introduced GSA’s new Mobile Workplace Pilot Project to the workspace areas. This GSA initiative drives space-saving practices through an open office floor plan and mobile technology and reduction of static, closed office space. To accomplish this change mid-phase, our team performed additional demolition to build back the open office design, installed infrastructure for the AV upgrades, and installed the new finishes and technology infrastructure. Gilbane successfully completed the work within the schedule and budget. The program implementation was such a success that the next phase of the Department of Commerce has been designed using the mobility open office environment on all floors.